Yes, I printed out that picture and put it on each classroom door to boost student morale this morning. 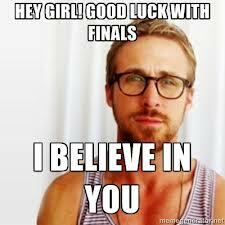 Yes, I believe that Ryan Gosling believes in me. Yes, it is almost undeniably true that his support is what motivated me not to break down in the middle of my Old Testament exam. That's right, I'm done! It was not my finest exam. For the questions I wasn't able to answer, I inserted jokes or pictures instead. Please explain Isaiah 1:4-5 and the corresponding Hebrew phrase discussed in class, including relevant scriptures? Please accept my drawing of a snowman in lieu of an answer. Again, the important thing is that I'm finished. Today marks the halfway point of the semester, which is unbelievable. Our teachers keep saying that the better half of the semester is about to begin, which is baffling. The semester is going to be measurably better than it already has been? How? As we finish classes and prepare to begin our studies of the New Testament, I've been thinking a lot about goals and habits and how our every day actions shape us. I had no expectations upon arrival, no goals, and no direction. I only hoped that I would make friends and find direction. I don't know where this will leave me in two months, but I hope it's somewhere worth noting. Must correct error - glad you are being inspired. Better to make such stellar goals. As trite as it sounds, I am so proud of you and so glad for this experience for you. So it turns out I'm psychic, and Ryan Gosling sent me the following message: Hey, girl. I really *do* believe in you.